I loved this scrumptious Easy Mongolian Beef dish! 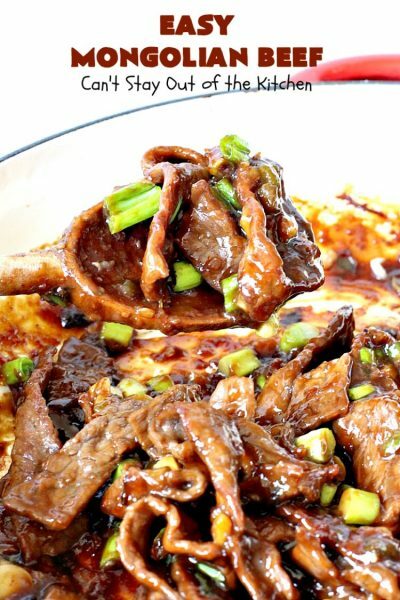 This entree is a terrific 30-minute recipe! It’s fantastic for weeknight suppers when you have to put a meal on the table quickly. It’s also one of the best tasting Asian style beef recipes with rice I’ve eaten. 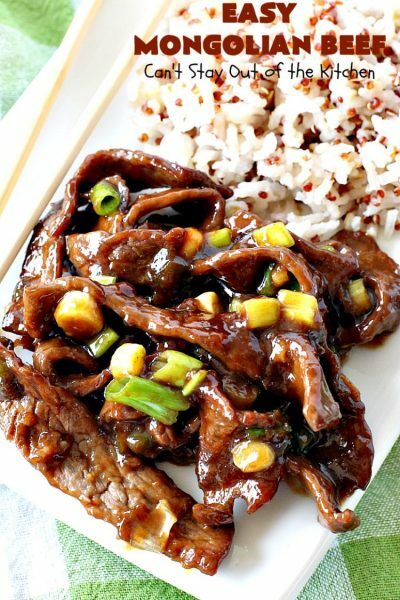 This beef entree includes ginger, jalapeno pepper and green onions in a very tasty soy and brown sugar sauce. It’s delightful served over rice with a quinoa blend. 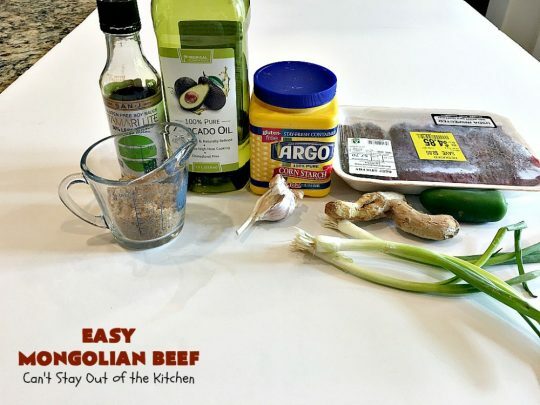 I was grocery shopping a couple of months ago and found a bottom round steak for stir fry that was on clearance. It was already sliced very thinly so I thought it would be great for a beef recipe served over rice. Believe me when I say I snatched it up pronto! So I started looking for Asian beef recipes that might be appropriate. I found this recipe and thought it would be excellent for using up this beef. I was right. The entree was so sumptuous and delicious that I absolutely loved it. I could have eaten this dish for days and was fortunate to have enough for lunch for a couple of meals too. Another nice thing about this 30-minute Easy Mongolian Beef recipe is that it’s gluten free. Seriously, if you enjoy an Asian flair to your meals, this one is fabulous. If you need a super easy weeknight meal recipe, this is it! Super easy. Super delicious. Super amazing. 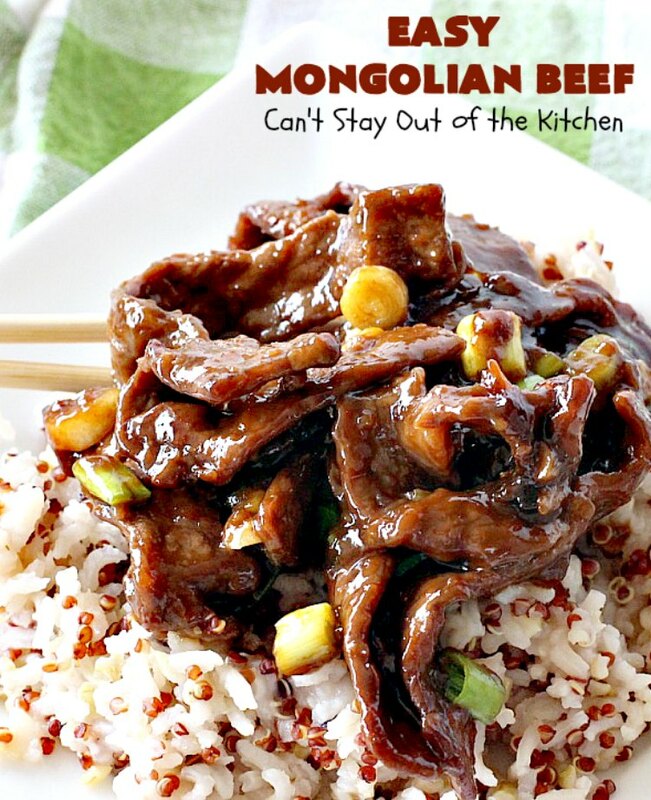 I loved this Easy Mongolian Beef recipe. 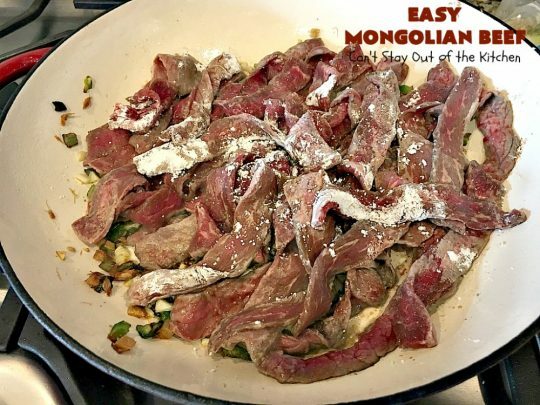 This tasty recipe takes only 30-minutes to prepare. It’s perfect for weeknight meals when you have to get dinner on the table quickly. 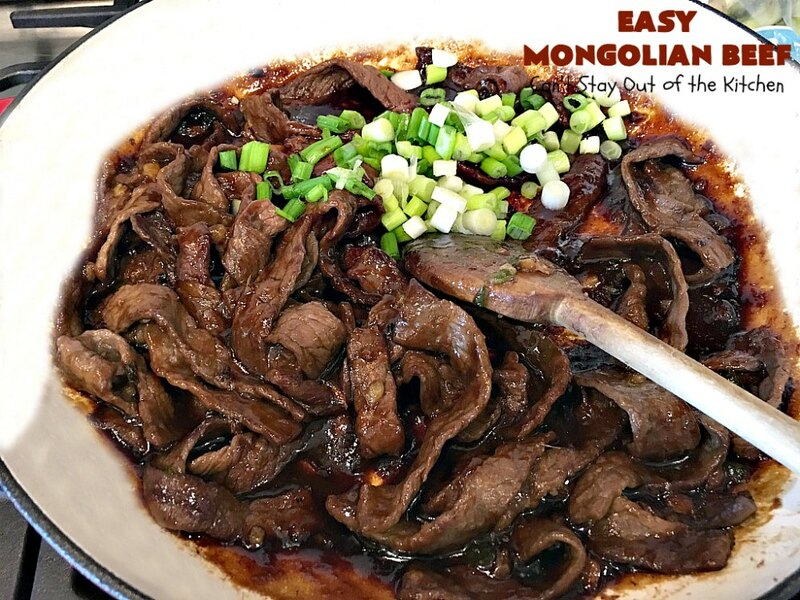 I found Easy Mongolian Beef absolutely delicious. It includes ginger, green onions and jalapeno peppers in a tasty brown sugar-soy sauce. 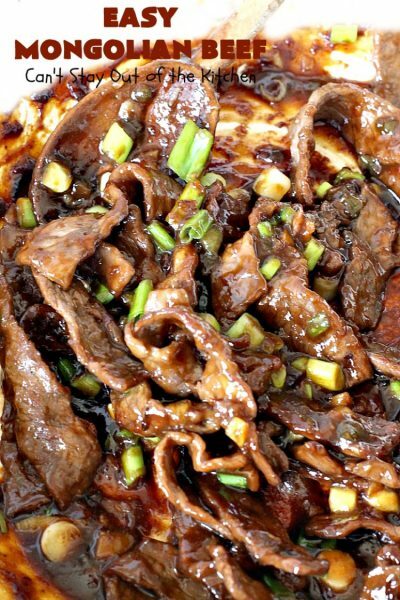 Dredge beef strips in two tablespoons cornstarch. Set aside. 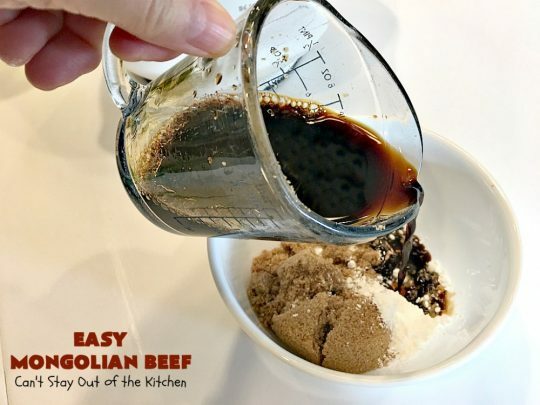 Combine brown sugar, two teaspoons cornstarch and a low-sodium soy sauce. Stir ingredients to combine. Set aside. Pour avocado oil into a large skillet. 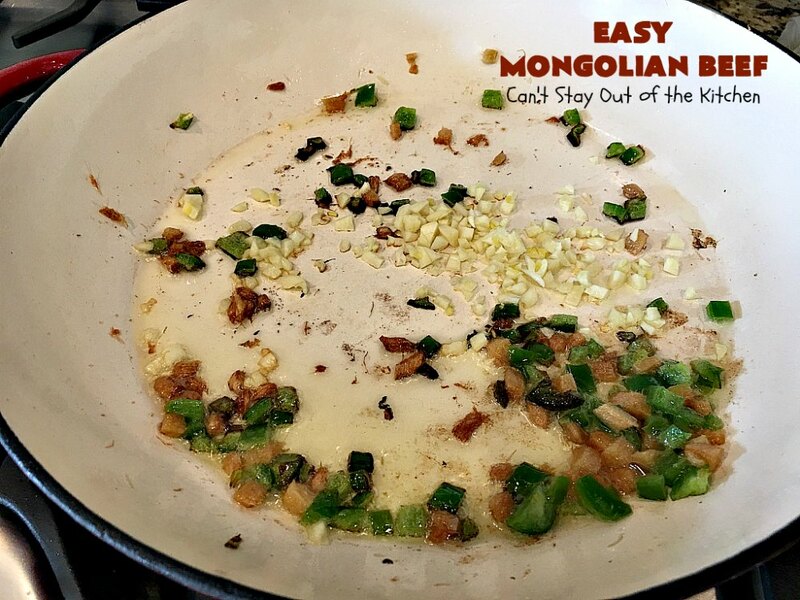 Add fresh ginger and finely diced jalapeno peppers. Saute a couple of minutes. Add minced garlic and saute one minute longer. Saute about 5 minutes until beef is no longer pink, stirring frequently. 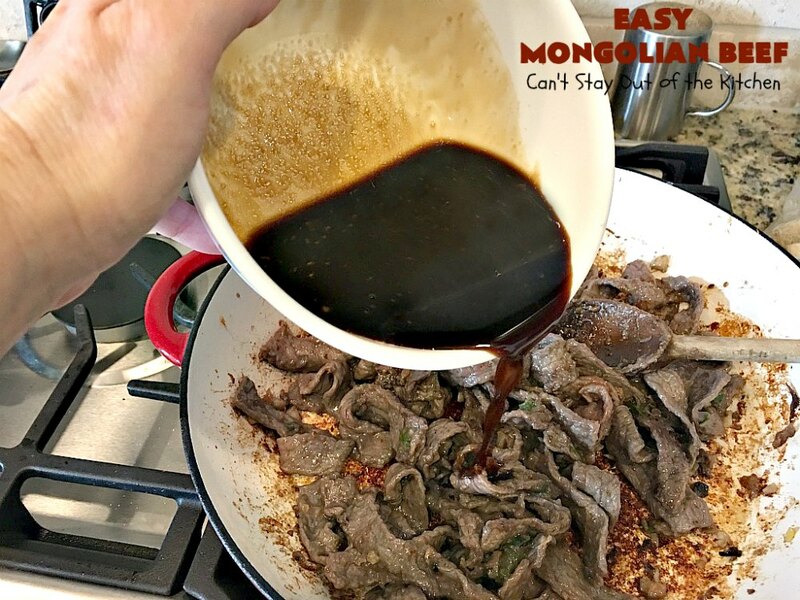 Add soy sauce mixture. Heat through until sauce thickens–about 2 minutes. This beef was so tender and delicious. 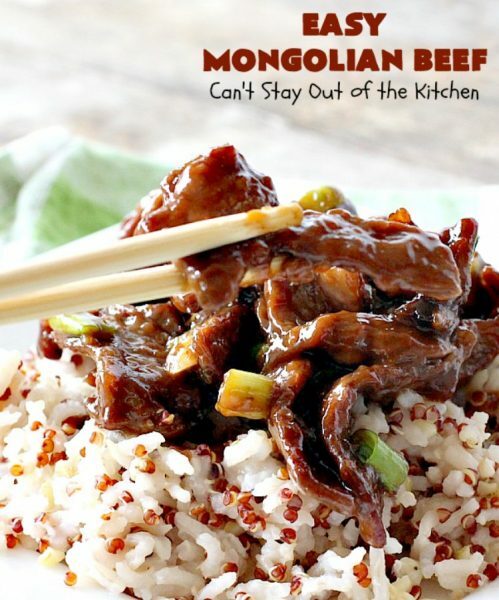 Serve Easy Mongolian Beef with rice. I used a rice with quinoa blend. It was so delicious. 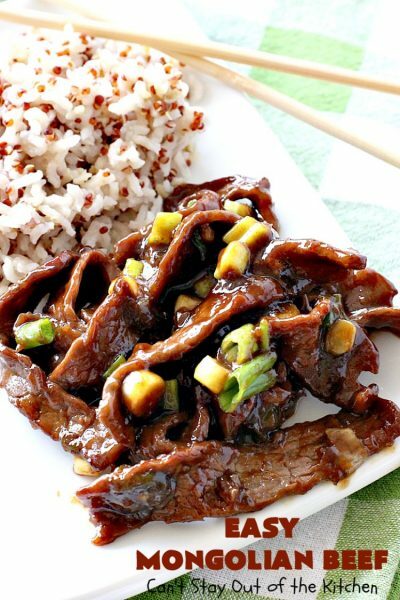 This amazing 30-minute meal uses ginger, green onions and jalapenos in a tasty sauce made with brown sugar and soy sauce. It's terrific for weeknight meals when you have to get a meal ready in a jiffy. Gluten free. Toss 2 tbsp. cornstarch with beef in a large bowl. 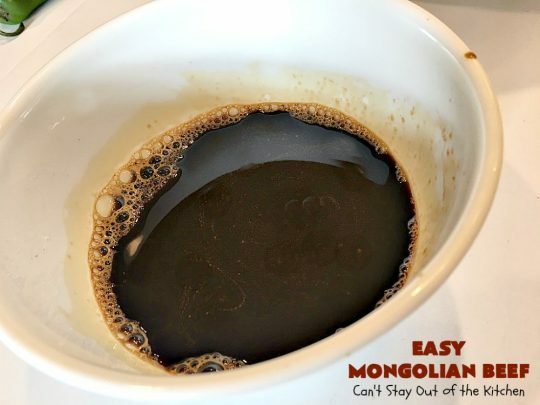 Combine soy sauce, brown sugar and 2 teaspoons cornstarch. Pour avocado oil into a skillet and heat to medium heat. Add jalapeno and ginger and sauté a couple of minutes. Add garlic and sauté one minute. 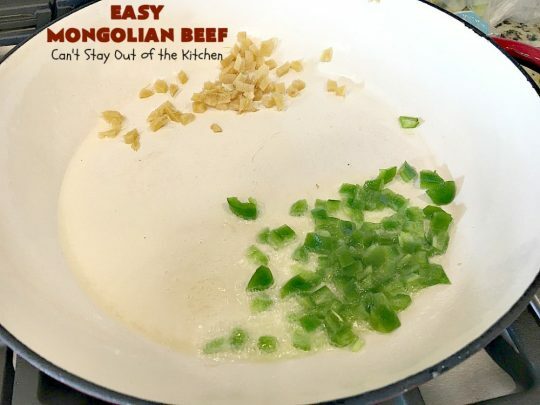 Stir in beef as evenly as possible. 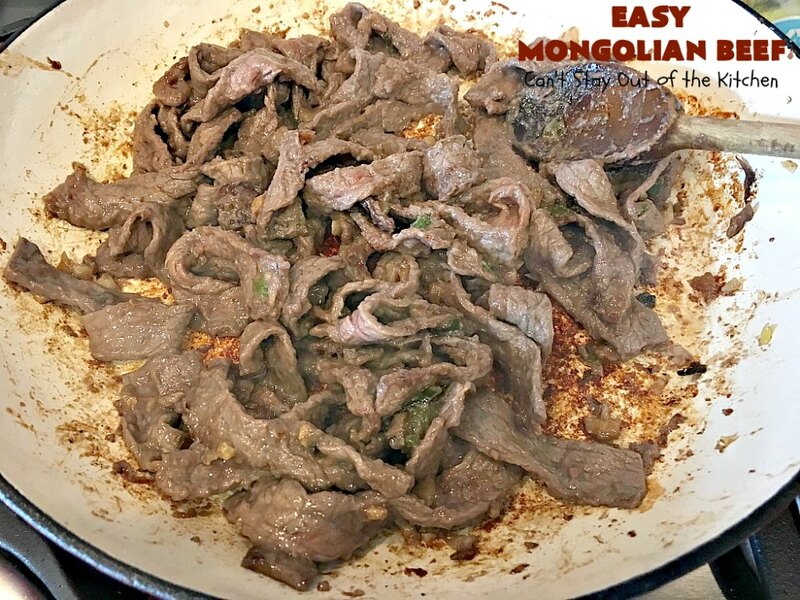 Stir frequently for about 5 minutes until beef is no longer pink. Stir and heat until sauce thickens about 1-2 minutes. Garnish with additional green onions, if desired. 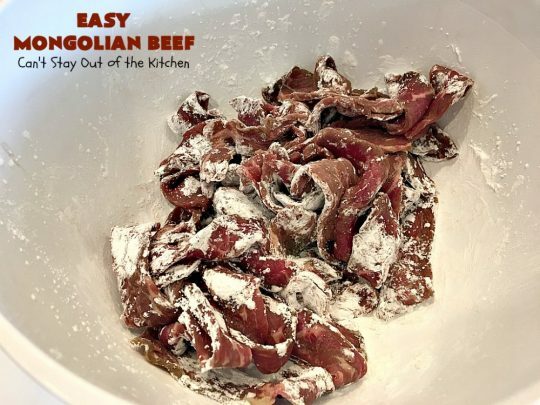 NOTE: You must use very thinly sliced beef for this recipe or the beef won't be tender enough. This beef entree was also wonderful heated up for leftovers. 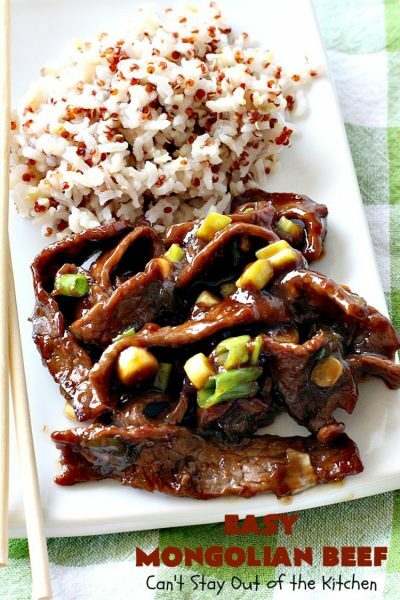 My husband loves meals with rice so this was a winner for him. 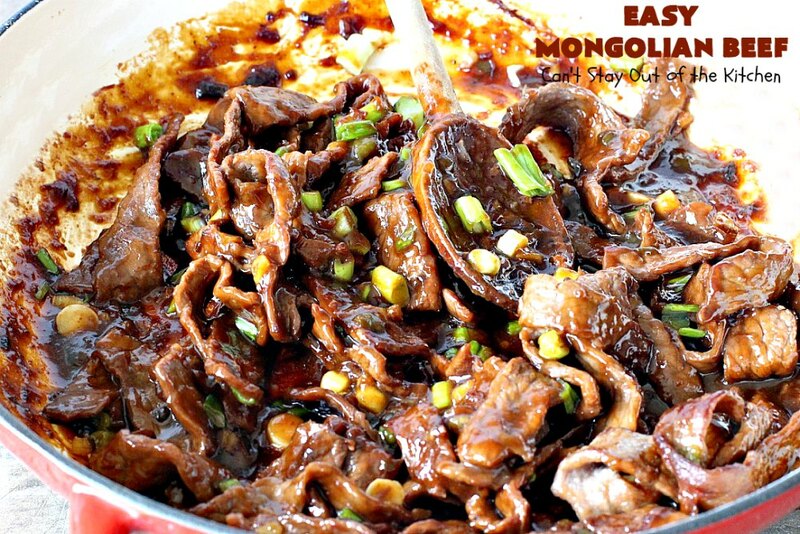 Easy Mongolian Beef is gluten free. I found every bite absolutely awesome!